Forest animals are such an interesting topic to study. Kids are fascinated by animals especially ones they may see on an afternoon walk through the woods. Hopefully, you won’t run into a bear on your afternoon walk, but you may sneak a peek at a squirrel or a deer. Even if you can’t see a bear, owl, or raccoon, kids love reading and learning about animals of all kinds. 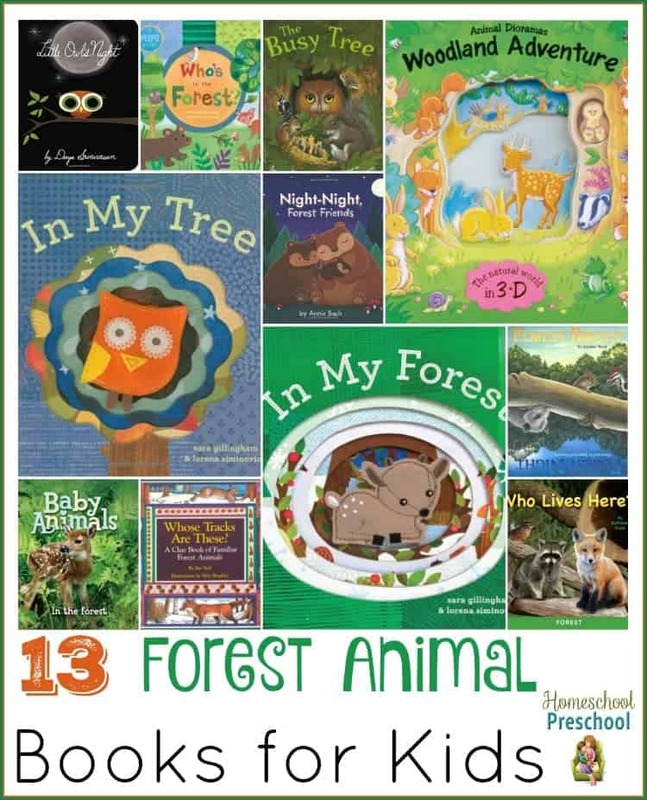 Here’s a fun list of books all about animals that live in the forest or woods. Over in the Forest – Jump like a squirrel, dunk like a raccoon, and . . . uh-oh . . . watch out for the skunk! Children learn the ways of forest animals to the rhythm of Over in the Meadow in this delightful introduction to the woodland habitat. They will also count the babies and search for hidden animals. In My Forest – Turn the colorful die-cut pages of this irresistible board book to discover just what makes little deer’s forest so cozy. Is it the fluffy snow? No, it’s their loving families! Bright pictures, sweet reassuring messages, unique layered pages, and an adorable finger puppet combine to create interactive reading and playtime fun! Whose Tracks Are These? A Clue Book of Familiar Forest Animals – A series of clues and striking illustrations detail how to identify a variety of pawprints found in the woodlands. Who Lives Here? – Many animals live in unusual places. With each flip of a flap young readers will discover the interesting places where small forest animals make their homes. From a beaver to a fox to a robin, a raccoon and a frog, children will see where these animals live, and learn that whether it s in a tree, a pond, or a cave, there’s no place like home! Forest Bright, Forest Night – Someone is always awake in the forest–and someone else is always asleep! Some animals are alert in daytime and sleep at night. Others are alert at night, and are sleepyheads during the day. Plus be sure to count the animals.You FLIP THIS BOOK from day to night and back–a nice hands-on way to show the same view day and night. Baby Animals in the Forest – The forest is full of baby wildlife from the spotted faun, to the tiny bunnies, the tinier mouse, and the black bear cub up the tree. Also included are some less familiar babies like the fox cub, the boar, and the red squirrel. Who’s in the Forest? – In this colorful peepo book, small children are invited to peek through the holes on every other page to answer the repeating refrain, Who’s in the forest, dark and deep? The playful, energetic, rhyming text introduces all sorts of creatures that make their home in the forest. In My Tree – Turn the colorful die-cut pages of this irresistible board book to discover just what makes little owl’s tree so cozy. Is it little owl’s sturdy branch and snuggly roost? No, it’s his loving family! Little Owl’s Night – It’s evening in the forest and Little Owl wakes up from his day-long sleep to watch his friends enjoying the night. Hedgehog sniffs for mushrooms, Skunk nibbles at berries, Frog croaks, and Cricket sings. A full moon rises and Little Owl can’t understand why anyone would want to miss it. Could the daytime be nearly as wonderful? Mama Owl begins to describe it to him, but as the sun comes up, Little Owl falls fast asleep. Woodland Adventure – As the sun sets, animals all over the forest get ready for bed. Papa rabbit tucks his babies in among the leaves, fuzzy bears settle in their den, and little foxes snuggle together under the moonlight. Up above, an owl hoots a lullaby. The gentle rhyming text and soft illustrations in this charming book will help little ones settle down for a cozy night. Woodland Adventure – Who do Bunny and Fawn meet when they set out on their big adventure? You Are My Baby – Turn the pages to match the baby animals to their parents, and learn early concepts along the way. In this new entry to the series, young ones will discover animal habits in the forest.